BHP Billiton Ltd. (ASX,NYSE:BHP), Barrick Gold Corp. (NYSE, TSX: ABX), Sesuveca del Peru and local Cia. de Minas Buenaventura SAA, were the four mining firms that won the largest number of Peruvian exploration concessions in 2012, reports local newspaper Gestion. According to the article, 582 companies requested an exploration permit last year, but only a few got most of them. In fact, from the 4,668 permits granted, giant miner BHP obtained 144; Venezuela’s Sesuveca, 151; Cia. de Minas Buenaventura SAA got 100; and Barrick Gold, 84. To date, BHP holds the rights to 1,425 potential projects in Peru, followed closely by Buenaventura, which owns 891. 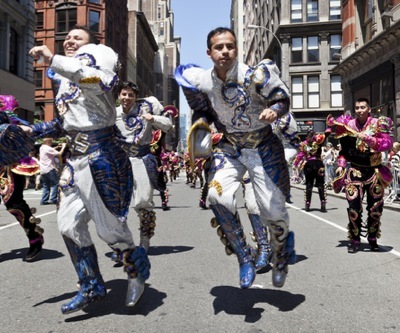 Image: Peruvian dancers celebrate national festivities in New York. By Lev Radin.